Home Small Group Leaders Facilitating Discussion Why Didn’t You Warn Me? “Leading a small group isn’t easy,” says my friend Pat Sikora. “It seems that more people are more wounded than ever before,” and it seems most of them are in our small groups! 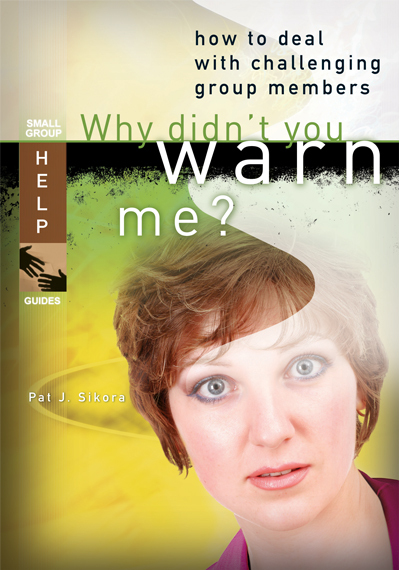 That’s why, when I was developing a new series of small group books for leaders several years ago for Standard Publishing, I called Pat and asked her to write a book we’d call, Why Didn’t You Warn Me? How to Deal with Challenging Group Members. Every small group leader should have this book on his or her bookshelf! Get the book from Standard here or from Pat’s website here. Pat creatively describes 18 common challenging people, like Mona Monopoly, Griselda Gossip, and Quentin Quiet, for example, and gives you step-by-step suggestions for dealing with them with grace and sensitivity. It’s a great reference book. I hand them out to every new small group leader at our church. Pat and I go way back. She wrote articles for The Lookout magazine when I edited a small group column there about 20 years ago. Then she wrote a series of articles for me after I started SmallGroups.com in 1996. I’m still a big fan of her work. You’ll find great material on her Why Didn’t You Warn Me? website too. Previous article What if Everything We’ve Always Believed About Small Groups Was Wrong?